We are so excited to honor Ashley Grice as our MOM of the Month! 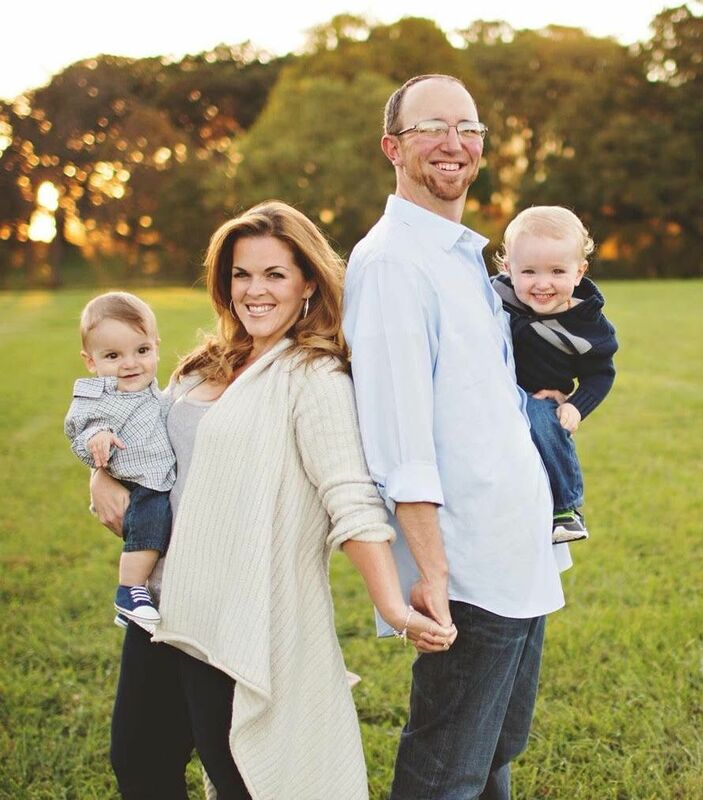 Ashley has been a member of our Village since summer of 2015 when she began attending Stroller Strides with her two adorable sons, Caleb and Daniel. Her warm smile, compassionate heart, and passion for health & wellness instantly connected her to our other moms. Now we can't imagine our classes without her! Since joining our Stroller Strides group, she has also started taking Stroller Barre and Body Back BOOST. We are SO proud of how hard she works in class and her dedication to her own health! Congratulations, Ashley! Hometown: Wheaton, IL My family still lives here in Wheaton, and this allows me and my three siblings to have dinner with our mom every Sunday evening. Tell us about who is in your family: I am the only girl in a house full of men! :) My husband Chris and I are blessed to have two amazing little boys, Caleb and Daniel. Caleb turned three in November and Daniel will turn one this week. Current/Previous career: In college, I majored in Youth Ministry and Adolescent Studies. For a couple of years following graduation, I was a part-time youth minister at a very small church. It was a volunteer position, but I loved ministering to the youth in my charge. I hope to officially return to Youth Ministry some day, but until then, I use my collegiate training to spiritually lead my little boys. Additionally, prior to meeting my husband, I worked in the wedding industry as a photography consultant and district manager for a nationwide wedding photography company. This definitely fostered my love for photography and really gave me an edge when it came to planning my own wedding in 2011. Since then, I have settled into the role of "stay at home mom" but have managed to pair my passions for health, wellness, and helping people by becoming a consultant for Young Living Essential Oils. I love seeing how these oils can help transform people's lives, so don't be surprised if you overhear me talking about them. And if you smell something (pleasant, I hope) during Stroller Strides or Stroller Barre, yeah, that's probably me. What was your childhood ambition: Growing up as one of four children, I have always wanted to be a mom. My own mother ran an in-home day care while I was growing up, so I was always surrounded by and caring for babies and children. While I hoped to get a job doing something that helped people, especially children, my dream has always been to have a house of my own full of little ones to love and care for. What does motherhood mean to you? Motherhood to me is pouring yourself out, body and soul, in order to found, foster, and fill the lives of your children. You're getting this incredibly unique opportunity to help form a new human and grow them into a completely new person. Who they become and what they grow up to do, in many ways, lies in the choices I make today. That has been such an unbelievably humbling responsibility. For me, it has meant giving them my body to live in, my bed to sleep in, my personal space to play in, and every ounce of love I have to develop in. While it can be exhausting at times, they're somehow capable of both completely filling and emptying my heart. I never want to look back on these years and regret not loving them enough. I know it will be over in the blink of an eye, so whatever sacrifice I endure today, I know it's only a season. I want to live in and love every moment. What is the furthest you have been away from home? While in college, I served abroad for about four months with a ministry in a rural mountain town of the Dominican Republic. It was an incredible experience and I absolutely loved the culture. I hope to return there some day with my family. How did you find FIT4MOM? I believe I was following a thread on a Wheaton Moms Facebook page about local fitness groups that allowed kids to be present during the class. As childcare has always been my biggest hurdle to making time for myself, learning that FIT4MOM allows mommies to interact with their children while simultaneously getting in shape, it sounded like the perfect scenario for me. How has FIT4MOM changed your life? F4M has impacted my life tremendously. Aside from providing our lives with structure in the most practical sense (we are up and out of the house by 9AM three times a week) it has given me the opportunity to remember what it feels like to do things for ME. I forgot what it felt like to challenge myself, to make goals, to crush through plateaus, and even to fit in a size I've only dreamed of. FIT4MOM has reminded me of my love for consistency and self discipline. I am healthier today and in better shape than I have ever been in my life. Favorite exercise: I love planking. I don't know why, but there's something about the mental focus required to hold yourself in that position that really fires me up. Proudest moment: A fellow mom told me that I inspired her to make different choices for her family that led them to a greater state of physical wellness and emotional happiness. She said she admired me, and it came at a time in my life where I felt like I was really struggling as a mother. It meant so much to me, and still humbles me to this day. 2) I loved eating/drinking them and actually thought these were healthy. Shortly thereafter, I became pregnant with Caleb and began researching how to have a healthy pregnancy - believe it or not, sugar cereals and energy drinks weren't on the plan. ;) I wound up giving it all away.